Posted by The Way to Akhirah , 21:07:00 Be the first to comment! Al-Qur'an Al-Kareem informs us about organizing the relationship between man and his Creator, man with himself and man with others. This is done so that harmony will be existent until the Day of Judgment. In addition to this, one cannot help but notice that in many places, the Qur'an includes stories about previous Prophets. What is the role of these Qur'anic anecdotes in carrying the da'wah during this and every age? There is no doubt that the Qur'anic stories are replete with signs, lessons and miracles, and that a da'wah carrier needs to be attuned to them. The Qur'an does not leave any aspect of our life without having an effect on it in one way or another. It is quite true that we are bound to the Shari'ah that Muhammad (saaw) brought, and we are not allowed to take the Shari'ah of those that preceded us. It should be noted, however, that when we examine the stories of previous prophets (pbut), we are not taking any legislation from them, only the wisdom and lessons about how they carried the da'wah. It is solely for this purpose that Allah (swt) mentioned these stories in the Qur'an. Now, if we had to choose a lesson from the Prophethood of Muhammad (saaw), one story that may initially come to mind is the Isra' and Mi'raj. This story reminds us of what happened to the Holy Land that Allah (swt) has blessed, and how today this land has been taken away from the Muslims. This should become a source of motivation for Muslims to save the Holy Land, and all other lands. The story of Musa (asws), in particular, has many lessons and many steps that Musa (asws) undertook when he called Firaun (Pharaoh) to believe. These actions are tactics that we now need to examine and study. Al-Qur'an Al-Kareem has a variety of stories of different Prophets. When it comes to Musa (asws) and his life, we can conclude that Surah Taha is enough as a source to expound upon the lessons from his life. We will examine this Surah, Insha'Allah, understand it, and see how Syed Qutb (ra) explained it in his book Fi-dhelaal Al-Qur'an (In the Shade of the Qur'an). Surah Taha begins with Allah (swt) telling Prophet Muhammad (saaw) that the Qur'an was not revealed to him (saaw) in order for him to suffer or live in misery, especially when people reject him and disbelieve in the message he (saaw) carries. This is because Muhammad (saaw) had no control, whatsoever, over the hearts of people, which would compel them to believe. As the Surah continues, it gives many details about the be'tha (when Allah sent Musa), and describes how Allah (swt) takes care of those who carry His message. Even though it is true that the stories comprise almost one-third of the Qur'an's contents, the story of Musa (asws) occurs most often, being mentioned many times and in many Surahs. As we begin to analyze Surah Taha in understanding the story of Musa (asws), we see that Musa (asws) and his wife returned from Medyan, where Shu'ayb (as) once lived. On the way back to Egypt he saw a fire near the mountain of Sina. He asked his wife to stay behind as he went to examine the fire, hoping to catch some of its flame and start a fire of his own, to help guide him and keep him warm during the cold night. This beginning shows how Allah (swt) prepares a da'wah carrier, both mentally and physically, for what is required of him in delivering the message. A da'wah carrier is willing to do what the da'wah requires from him no matter how difficult the challenge is. This example exhibits this attitude, where Musa (asws) knew he would have to climb mountains and walk long distances to reach his destination. "Verily! I am Allah! None has the right to be worshipped but I, so worship Me, and offer prayers perfectly, for My remembrance. Verily! The hour is coming - and My Will is to keep it hidden - that every person may be rewarded for that which he strives. Therefore, let not the one who believes not therein, but follows his own lusts, divert you therefrom, lest you perish (20:14-16)." To believe in Allah (swt) and His oneness; to believe that Allah (swt) is the only one who deserves to be worshipped and not anyone or anything else; and to expect no reward from anyone, whomsoever, except from Allah (swt). In doing so, the da'ee will pay no attention to those who are trying to deviate him, or those who are telling him things like: "you are just wasting your time", "nobody listens to you", or "why don't you do something more pragmatic." "And press your (right) hand to your (left) side, it will come forth white (and shining), without any disease as another sign, (20:22)." This was another miracle the Messenger of Allah (swt) would use as proof of his prophethood. Once all of this took place, then all of his senses, abilities, and every part of his body was ready to carry the requirements of this obligation from Allah (swt). "Go to Firaun! Verily, he has transgressed (all bounds in disbelief and disobedience, and has behaved arrogantly, and as a tyrant) (20:24)." "Musa said: 'O my Lord! Open for me my chest (grant me self-confidence, contentment, and boldness). And ease my task for me; And loosen the knot (the problem) from my tongue, (i.e. remove the impairment in my speech), that they understand my speech, And appoint for me a helper from my family, Haroon, my brother; Increase my strength with him, And let him share my task (of conveying Allah's message and Prophethood), That we may glorify You much, And remember You much, Verily! You are of us Ever a Well-Seer (20:25-35)." He asked for all this because he knew the weaknesses he and his brother had, and would have to overcome in order to accomplish their mission. With this, Allah (swt) reminds us that whenever he orders someone to do something, whether it is one of His prophets or a da'wah carrier, He will provide them with the abilities to achieve their obligation. Allah (swt) will never ask His da'wah carriers to do something beyond their reach or their abilities. "Allah said: 'You are granted your request, O Musa! (20:36)." Allah (swt) continues to remind Musa (asws) of the favors that have already been bestowed upon him, starting with how he was supposed to be killed at birth, like the rest of the children that Firaun was killing, but was spared. This reminds the da'wah carriers that Allah (swt) will never let them down, because they are the ones that are trying to establish His Deen, and they are the ones who are trying to spread the call to obey Allah (swt) amongst all of mankind. "Go you and your brother with My Ayat (proofs, evidences, verses, lessons, signs, revelation, etc.,) and do not, you both, slacken and become weak in My remembrance. Go to Firaun, verily, he has transgressed (all bounds in disbelief and disobedience, and has behaved arrogantly, and as a tyrant). And speak to him firmly, perhaps he may accept admonition or fear Allah (20:42-44)." This demonstrated to us that when Allah (swt) ordered Musa (asws), Muhammad (saaw), and all the prophets to carry the da'wah, He also told them how to carry it. He even told them which style to use, as in this example. They were told not to be harsh, rather they should be firm with the people, even with the oppressors. Also, they shouldn't become desperate or frustrated, nor should they ever lose hope that the people will be guided. This is because once frustration gets to the heart of the da'wah carrier, then the da'wah will lose its momentum and its spark. This will make the da'wah carrier slow his efforts, and eventually stop him from carrying the da'wah. Those who deliver da'wah must continue carrying it without any frustration, even if the road is full of Firauns. "They said: 'Our Lord! Verily! We fear lest he should hasten to punish us or lest he should transgress (all bounds against us)' (20:45)." "He (Allah) said: 'Fear not, Verily! I am with you both, Hearing and Seeing' (20:46),"
reminding them that He, Allah (swt), Al-Qadir, the one in control, the one above every oppressor and every person, the one who is stronger than anybody, was with them. This was enough for them to become relaxed, allowing them not to fear anything, and to realize that when Allah (swt) is with them, then no one can harm them. "So go you both to him, and say: 'Verily, we are Messengers of your Lord, to ask you to let the Children of Israel go with us, and torment them not; indeed, we have come with a sign from your Lord! And peace will be upon him who follows the guidance!' (20:47)." They were the two messengers sent to save Bani Israel from the oppression of Firaun, to bring its people back to the 'aqeedah of Tawheed, and to take them to the Holy Land. This was also good news to Muhammad (saaw), reassuring him that Allah (swt) would never let him nor those who follow him, down. The ayat continues, relaying to us the conversation that took place between Musa (asws) and at-taghiya (the tyrant), Firaun. "Firaun said: 'Who then, O Musa, is the Lord of you two' (20:49)?" Then, "Musa said: 'Our Lord is He Who gave to each thing its form and nature, then guided it aright' (20:50)." "(Firaun) said: 'What about the generation of old' (20:51)." "(Musa) said: 'The knowledge thereof is with my Lord, in a Record. My Lord is neither unaware nor He forgets. (20:52)." "Who has made earth for you like a bed (spread out); and has opened roads (ways and paths etc.) for you therein; and has sent down water (rain) from the sky. And We have brought forth with it various kinds of vegetation. Eat and feed your cattle, (therein). Verily, in this are proofs and signs for men of understanding (20:53-54)." "Thereof (the earth) We created you, and into it We shall return you, and from it We shall bring you out once again (20:55)." "He (Firaun) said: 'Have you come to drive us out of our land with your magic, O Musa? Then verily, we can produce magic the like thereof; so appoint a meeting between us and you, which neither we, nor you shall fail to keep, in an open, wide place where both shall have a just and equal chance (and beholders could witness the competition)' (20:57-58)." "(Musa) said: 'Your appointed meeting is the day of the festival, and let the people assemble when the sun has risen (forenoon)' (20:59)." Now in order to understand what type of person Firaun was, we must remember his crimes, namely that he killed the sons of Israel, he used to kill their men and their boys, leaving their womenfolk alive. He did this because he was so afraid of his people, fearing that they would threaten his status in life, which he was so careful to protect. He paid attention to nothing but his kingdom, to the throne he sat on, and whatever else he owned. This behavior is typical of our rulers today. They are so fearful that some ideological movement or political parties who are trying to implement Islam as a complete system, which would wrest their rulership from them. That is why today's rulers slander and hunt down such movements the same way Firaun attacked Musa (asws) and his people. The way Firaun challenged Musa (asws), thinking that Musa (asws) would give up, serves as a valuable lesson for da'wah carriers nowadays. However, Musa (asws) did not give up, he accepted the challenge because he was assured that Allah (swt) was with him. He was confident that the Haqq would win and the batil would be defeated, no matter what the oppressors and the liars did. "So Firaun withdrew, devised his plot and then came back (20:60),"
He assembled all his magicians and all his powers. This is quite similar to what our current rulers do today when they are confronted with the Haqq. Their aim is to manipulate the minds of the populace, trying to make them believe what the rulers want them to believe. This can be easily observed when we hear government backed scholars giving us fatawa that legitimize whatever haram our rulers commit, such as accepting peace with a Jewish state established on Muslim lands, or inviting the troops of the kuffar to Muslim lands to fight against other Muslims. Our rulers attack those who carry da'wah by all means, at all times. "Musa said to them: 'Woe unto you! Invent not a lie against Allah, lest He should destroy you completely by a torment. And surely, he who invents a lie (against Allah) will fail miserably (20:61)." This statement made its way into the hearts of some of Firaun's people who were listening. Those who heard what Musa (asws) was saying started to think about it. Some of them believed that Musa (asws) was calling for Haqq, and Firaun was on the side of batil. "Then they debated with one another what they must do, and they kept their talk secret (20:62)." This shows us that good elements do exist in society during all times. They may even be from the offspring of the kuffar or from the oppressors. More importantly, this shows us that the da'wah carriers must not hesitate from saying the truth anywhere they are, at any time, because this word of truth might influence some people. Even in this example, we should know that the wife of Firaun became a believer. "They said: 'Verily! These are two magicians. Their objective is to drive you out from your land with magic, and overcome your way of life. So devise your plot, and then assemble in line. And whoever overcomes this day will be indeed successful' (20:63-64)." The ayah indicates that the dawah of Musa (asws) was comprehensive and was accused of threatening the status-quo. Also, the ayah shows that Firaun underestimated the people around him, assuming that they all would help him, and they would not say anything against him. However, he was mistaken. From this there is another lesson to be learned, that the Will of Allah (swt) was there, and that He (swt) witnessed all that occurred, and made Firaun offer to Musa (asws) the challenge to confront him in front of the people. This demonstrates how Allah (swt) will help da'wah carriers develop a platform from which they can address the people in an effective manner. "They said: 'O Musa! Either you throw first or we be the first to throw (20:65)?" "We (Allah) said: 'Fear not! Surely, you will have the upper hand. And throw that which is in your right hand! It will swallow up that which they have made. That which they have made is only a magician's trick, and the magician will never be successful, no matter whatever amount (of skill) he may attain (20:68-69)." Again, this is because what Musa (asws) was doing was the Haqq, and what they were doing was the batil. The batil will never succeed, no matter how powerful its proponents appear. When the batil is confronted with the clear Haqq, then the batil will collapse. Musa (asws) responded to the order of Allah (swt), and threw down his staff. Upon doing this, a reaction that nobody expected took place. "So the magicians fell down prostrate. They said: 'We believe in the Lord of Haroon and Musa (20:70)." "(Firaun) said: 'Believe you in him (Musa) before I give you permission? Verily! He is your chief who taught you magic. So I will surely cut off your hands and feet on opposite sides, and I will surely crucify you on the trunks of palm-trees, and you shall surely know which of us [I (Firaun) or the Lord of Musa (Allah)] can give the severe and more lasting torment (20:71)." Firaun was arrogant, believing that before the magicians could become mu'mineen (believers), his permission was required. This is the way all of the oppressors are, believing that the people are their slaves, and that they have to do whatever they command, whenever they want it. "They said: 'We prefer you not over the clear signs that have come to us, and to Him (Allah) Who created us. So decree whatever you desire to decree, for you can only decree (regarding) this life of the world (20:72)." "Verily! Whoever comes to his Lord as a Mujrim (criminal, polytheist, disbeliever in the Oneness of Allah and His Messengers, sinner, etc. ), then surely for him is Hell, therein he will neither die nor live. But whoever comes to Him (Allah) as a believer (in the Oneness of Allah, etc. ), and has done righteous good deeds for such are the high ranks (in the Hereafter), - Everlasting Gardens ('Adn Paradise), under which rivers flow, wherein they will abide forever: such is the reward of those who purify themselves [(by abstaining from all kinds of sins and evil deeds) which Allah has forbidden and by doing all that which Allah has ordained)] (20:74-76)." Not only did they tell Firaun how they felt about his threats and their feelings towards this life, but now they began to threaten him. They told him that his crimes and his tortures would lead him to the torture of jahannam, a punishment which is more severe than Firaun could ever impose, leaving him to never die and never live. They declared their belief in their Lord, and vowed to never do anything but the khayr (good), in order to attain the highest level in Jannah. This level of conviction is completely foreign to the understanding of the oppressors. Their hearts are sealed, and refuse to be opened to the truth. 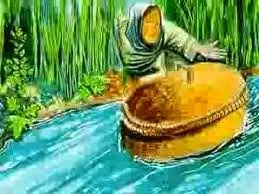 The ayat described the victory of the Haqq and the defeat of the batil, and exhibited the blessings of Allah (swt) when He (swt) directly intervened to save Musa (asws) and his people, and how He (swt) made Firaun and his soldiers drown in the sea. This came at a time when Musa (asws) and his people had no hope, because they were much weaker than the army of Firaun. The ayat tell us that the end of the struggle between the believers and kuffar resulted in a victory for iman and defeat and humiliation for the kufr. This serves as a good example for us today, showing how in the past the believing sons of Israel were tortured and they had no helper or supporter whatsoever. Nowadays, the da'wah carriers who carry the Haqq, have no support or help, and no one to rely on, except Allah (swt). Consequently, they must remain on the Haqq, until Allah (swt) provides them with victory, the way He provided previous believers with victory. ".Verily, Allah will help those who help His (cause). Truly Allah is All-Strong, All-Mighty (22:40)." The batil, the falsehood, will not last forever, it will be defeated sooner or later. The da'wah carriers must work until Allah (swt) gives His victory to the Muslims. "It is He Who has sent His Messenger with the guidance and the Deen of truth (Haqq), to make it superior over all other ways of life, even though the Mushrikun hate it (9:33)." Oh Shabbab of Muhammad (saaw)! We call upon you to raise up once more the rayaat (flags) that Muhammad (saaw) held up in the past, under which kufr and oppression were destroyed. Carry them, lift them, and spread the da'wah everywhere, so that you will live happily, your Ummah will live happily, and the Haqq will become superior on the earth, as Allah (swt) wants it to be.